Hi Rachel, tell us a little bit about yourself and your role at Barrhead Travel?I am currently a member of the web content team. Specifically, I mainly deal with the testing and sending of all our e-mail newsletters, and updating web pages with new holiday deals and marketing campaigns we have running. I have also been one of the key members in the migration of our online systems. In other words, I make the website as pretty and user-friendly as I possibly can. 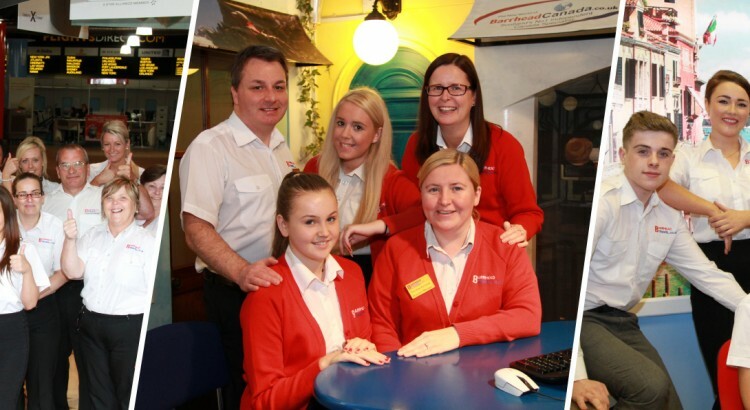 Hi Rachel, tell us a little bit about yourself and your role at Barrhead Travel? I am currently a member of the web content team. Specifically, I mainly deal with the testing and sending of all our e-mail newsletters, and updating web pages with new holiday deals and marketing campaigns we have running. I have also been one of the key members in the migration of our online systems. In other words, I make the website as pretty and user-friendly as I possibly can. I start an average day by sending out the e-mail marketing schedule for the week. I will then look over my e-mails to see if any evidence is needed for our campaigns and collate this along with the statistics for the individual Marketing Executives. Then, I would make any web updates that have been requested. This could be updating offers for the product team or updating new videos or images for marketing. I will also ensure I have pulled all the customer segments for the e-mail newsletters being sent out (I usually try work a day ahead). Once another member of my team has created one of our emails, I am always the first round of testing for every e-mail newsletter that goes out. We then may make any necessary amends and send out to our larger testing data. Once a newsletter has been signed off, it is then my responsibility to ensure it is going out to the right customers and schedule it for a time that will increase its success rates. I joined the company in September 2015 as a Modern Apprentice. What did you do as part of your Modern Apprenticeship? I had to demonstrate that I was developing skills on the job. My assessor would come in and I would explain everything I was learning and show them what I could do. What kind of person would you say is suited to a career in content editing? And what advice would you give them? Firstly, you need to be a very organised person and good at prioritising workload as things can get quite hectic. You also need to be good with computers. Being in web content is essentially being online all day and working on difference Content Management Systems. Knowledge of HTML is also valuable. However, learning on the job was key for me. Honestly, the people. I met some really great, intelligent people who I am and will remain friends with since starting with this company. I’m thankful for the people in my team who helped and trained me when I first started, which must have required a lot of patience! Without them, I never would have got through the apprenticeship and secured a job at the end. Hi Angela, tell us a little bit about yourself and your role at Barrhead Travel?On joining Barrhead Travel, the first department I worked in was cruise sales. I then moved onto package department, flights department, family fund department, last minute.com department and then the internet department before moving to the customer service department in December 2012. I have been Team Leader in the department since 2017 and enjoy my role very much. Modern Apprenticeship Scheme to Manager!